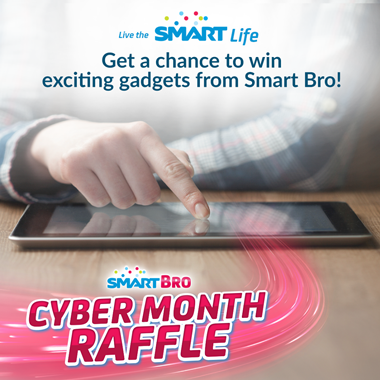 Join the Smart Bro Cyber Month Raffle Promo and get a chance win amazing gadgets from Smart Bro Prepaid. Simply purchase Smart Bro prepaid products in any selected Cyberzone branches, fill up the raffle entry and drop in drop boxes. Promo runs until August 31, 2015. Join now! For more promo details please see at smart.com.ph/bro/promos/cybermonth. You can also UnliPromo and Smart Communications Facebook page for the latest news and updates. Sana po manalo aq para sa anak ko na lagi kaming naghihiraman Ng cp.